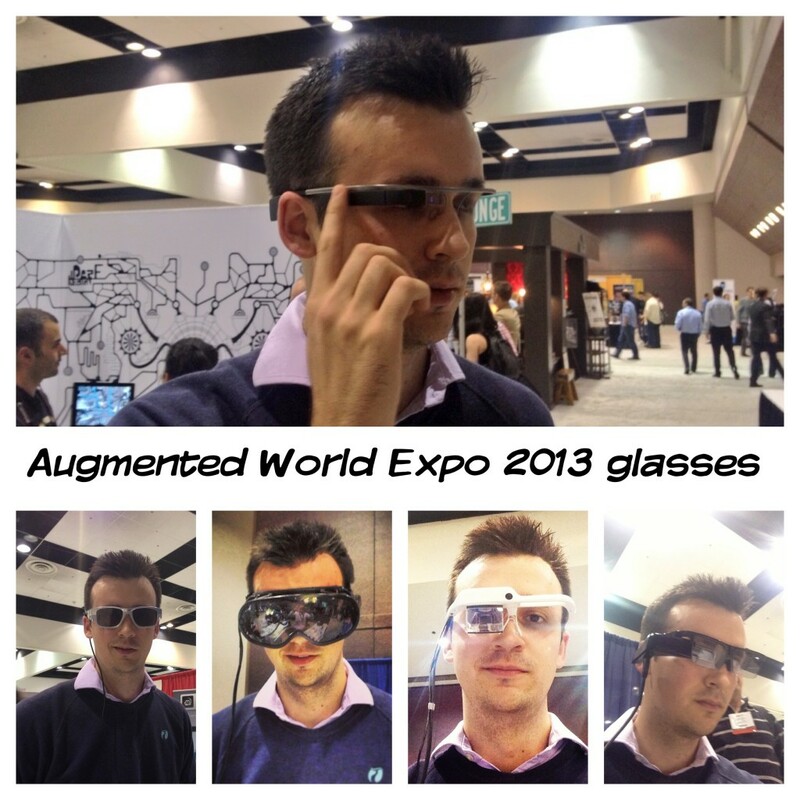 I attended the Augmented World Expo 2013 (AWE). This event provided a meeting point for augmented reality hardware manufacturers to software SDK developers and from app developers to robotics uses of AR and was held in the Santa Clara Convention Centre in California. At the event Nic Doodson and I (Will Powell) presented Keytree CEO Vision within the business side of presentations. We presented just after Aiaz Kazi from SAP. Keytree’s CEO Vision, for which I was lead developer on, demonstrates the real possibilities for ‘Minority Report’ like interfaces as they become commonplace and has since been multi award winning. Google Glass – This is definitely one of the products with the most buzz around it. It has a brilliant build quality and it is understandable that this is only in developer’s hands because the functionality needs to be extended in order to be more consumer facing. However combining this with our expertise, we can deliver enterprise applications on this kind of device. GlassUp – A neat product with a great price point. Only a single monocular display where a small amount of the glass shows a projected image in monochrome, but very lightweight and unobtrusive. This will be on Kickstarter shortly. Laster Technologies – There are several products created by Laster Technologies, which were very impressive with the quality of the display screens. I was impressed especially by the contrast with the lit and non-lit areas of the screen. It made the marker-less experience very compelling for the ski goggle’s solution. I look forward to seeing the binocular version of the monocular glasses as well. Vuzix Star and M100 – are both products we have been tracking with our concept video earlier in the year for the M100 and our use of Star 1200 XL and XLD are great additions to the line up. Epson Moverio BT-100 – aside from being quite bulky give a good display and with the compact Android power unit are very portable and require no additional processing as the other glasses from Laster and Vuzix do. Alongside these hardware manufacturers there are the software creators such as Vuforia and Metaio, which were showing off some very impressive demos. Overall AWE2013 was a fantastic event to both view and demonstrate AR concepts, software and hardware, which left excitement and anticipation of what’s coming next. CEO Vision generation 2 is a completely new build of CEO Vision with a vast array of improvements. The system now provides a fully interactive, precise working environment. At Keytree we have created a new application called Store Trek that delivers a 3D shopping experience in your home using the microsoft Kinect. Powered by K-Motion Store technology. This is the first incarnation of a 3D store that crosses the divide between in store and online shopping. Online is quick and convenient and products are recommended to you but the experience is not very engaging or immersive. In store you can see entire product ranges but they are not tailored to you, you have to travel to the store and get stuck in the queue at checkout. 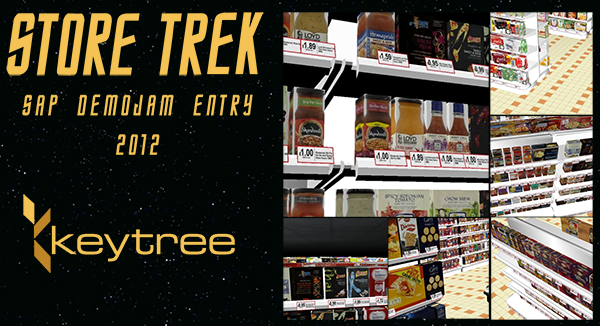 Store Trek takes the benefits of in store by delivering tailored virtual shelves in a virtual store layout driven by a personalisation engine you would have with an online store. The kinect allows you to walk round the TV with the shelves automatically adjusting to give you the rich 3D experience. Rendering tens of thousands of products from real retailers in realtime you can purchase items by reaching out towards the shelf and the product will be added directly to your basket. This eCommerce solution based in the cloud could be used to shop for your groceries from Tesco or items from Amazon or Ebay. Update: Store Trek has also been featured in the independent click here to see the article the supermarket experience where you never have to queue.